Time was when agriculture was the backbone of the Nigerian economy. The agricultural sector was so huge and lucrative that not only did it sustain the regional economies in Nigeria in the early 1960s, it provided jobs for many Nigerians at the time. The economy was so well calibrated that agriculture underpinned development, as wealth creation was evenly dispersed in rural areas, where farm work was done and urban centers, where industries used processed produce in their plants. Revenue from agriculture was used to drive growth and development in a time that many have come to describe as the golden age of Nigeria. It is instructive to note that the Nigerian economy in those times was carefully designed such that each region grew industrial systems that prioritised the peculiarities of its comparative agroecological advantage. With this, cocoa served as the bedrock of the economy in the Western Region, groundnut and other cash crops were the cash-cows for the North and oil-palm ruled supreme in the Mid-West, later Bendel, a part of which is now Edo State. Though fortunes from oil palm production have ebbed due to the impact of poor policies and the detrimental romance with oil money, Edo State has retained a fair share of its industrial base, with the presence of oil palm and cement production companies. However, much of the state’s agricultural potential have not been fully exploited. More so, industries are not evenly distributed across the state, technical capacity is limited and the inflow of foreign capital is sparse. In a bid to overturn this narrative, the Edo State government led by Governor Godwin Obaseki, after ensuring that the right policies and investment-friendly legislations are in place, embarked on an investment tour to Asia, with stops in Singapore, Indonesia and India. There is a background to this drive. An astute investment banker, Obaseki came into government with a mission to grow Edo State into an industrial hub by leveraging his expansive network in development financing. For the trip to Asia, he intended to strengthen the relationship with some of the big companies in Asia, with whom he had worked to raise financial instruments for investments in the past. So, as governor, Obaseki hopes to drive Foreign Direct Investment (FDIs) to engender a private sector-led local economy through investments in agribusiness, manufacturing, digital services, technical education and energy solutions. This was the backdrop of the governor’s recent investment visit to the three Asian countries —Indonesia, Singapore and India — that are revered as models in the annals of development, having grown their economies through agriculture, manufacturing, science and technology and innovative governance. The visits are avenues to compare notes and take advantage of ideas and approaches applied by these countries for the benefit of Edo State and its people. Not only has the governor secured a $50million investment deal for the state that would create 50,000 jobs, he has struck partnerships that would see the state take the lead as a major producer and exporter of oil palm produce. Already, work is ongoing to revamp Benin Technical College to produce the desired manpower for the various aspects of the state’s economy and host the planned Benin Industrial Park, that will expand the industrial base of the state to include agricultural processing, data services, and manufacturing. The visit to Indonesia is in acknowledgment of the country’s status as the number one producer of oil palm in the world. Hence, with Edo State being a major producer of oil palm in Nigeria, the governor intends to leverage the expertise of the Indonesians in repositioning Edo State, as the oil palm capital in Nigeria, while providing jobs for the state’s teeming youths. On arriving Indonesia, the governor headed to the 101-year-old Indonesian Oil Palm Research Institute in Medan. He lauded the research capacity of the institute, seeing that Edo people would benefit from not just the advanced research on oil palm at the institute if deployed in the state, but that the institution would serve as good partner to its counterparts in the state. During the visit, the state government entered discussions with the institute to help reinvigorate the oil palm sector in Edo State. This, the governor said, would build on shared technical expertise between Edo state and officials of the institute. 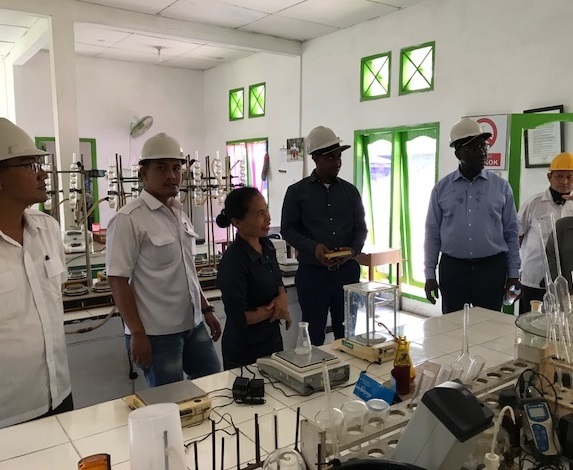 The Indonesian research institute is made up of an oil palm plantation, processing plant, laboratories, nursery and oil palm refining facility. The oil palm sector is the country’s most valuable sector, as it accounts for 32 percent of its labour force. He further said that institutes like NIFOR and the College of Agriculture in Iguoriakhi, are being repositioned to support the agricultural sector, and that the support from Indonesia would help kick-start a revolution not just in oil palm production but in its processing and marketing. The Edo State delegation headed to Singapore after an eventful outing in Indonesia. The visit to Singapore was aimed at harnessing the capital and expertise of industry actors in the country as strategic partners in the mandate to build viable industries in Edo state. These industries are expected to leverage on the state’s areas of competitive advantage, such as agriculture, manufacturing, technical service, among others. As the first fruit of the visit, Governor Obaseki concluded arrangements for the Tolaram Group to invest $50 million in oil palm and cassava production in Edo, an initiative that is expected to create about 50,000 jobs in the state. Thereafter, the governor met with an expanded group of industrialists in Singapore. The August meeting was an opportunity for the Edo State government to sell investment opportunities to and build strong ties with leading companies in Singapore and encourage them to invest in the state’s manufacturing, agribusiness, digital services, food processing and urban development sectors. Obaseki unveiled ongoing reforms in technical education, with the revamping of Benin Technical College, a favourable business climate with investment-friendly laws and the rising profile of the state as a hub to reach other parts of Nigeria. The Benin Technical College, he said, would produce resourceful and technology-savvy workforce for industries, while the laws guarantee security of investments and profit repatriation. He explained that his government places high premium on the electoral promise he made to create 200, 000 jobs in the first instance, and assured that the state adheres to the rule of law and the adoption of cost-efficient, technology-driven processes. At the next stop in India, the governor got a preliminary report on the establishment of the Benin Industrial Park, which would fast-track capacity building for the youths in Edo State. The park is to be built in partnership with the Mahindra group. The report outlined the project implementation plan, showing how the park will be used to draw up and implement models to be used in repositioning the state as a centre for technical training. This would benefit Edo youths, whose capacity would be needed in industries and factories to be sited in the state. “We visited the headquarters of the Indian company in March, this year, to share our idea of an Industrial Park with officials of the company. Three months later, the company came to Benin City for a feasibility study and today we are happy that we are ready to hit the ground running” Obaseki said.